A tenant in New York has the right to a full security deposit refund, if by the end of their tenancy, they have paid all the rent, cleaned the premise and have no critical damages on the property exceeding regular wear and tear. The landlord must return the owed security deposit within a “reasonable time” (interpreted to be between 21-45 days). If the landlord has failed to return the owed amount or provide a statement of deductions within the statutory time frame, and have failed to respond to a security deposit request, the next step for the landlord is to send a Security Deposit Demand letter. This letter sends a strong message and gives the landlord the final warning for them to refund the security deposit or face legal consequences. At this point, the tenant also has the option of filing a case against the landlord in a New York small claims court, but since it can take a lot of time, a Demand letter is the best option. This HomeTitan Security Deposit Demand Letter is all you need to send a clear warning that will prompt the landlord to pay back the owed security deposit if sending a request letter has failed. Since the New York landlord-tenant laws are clearly referenced in this letter, the landlord will know that it is in their best interest to repay the owed amount or otherwise face the law. Send this letter via certified mail to get a return receipt and also remember to keep your own copy for future references. 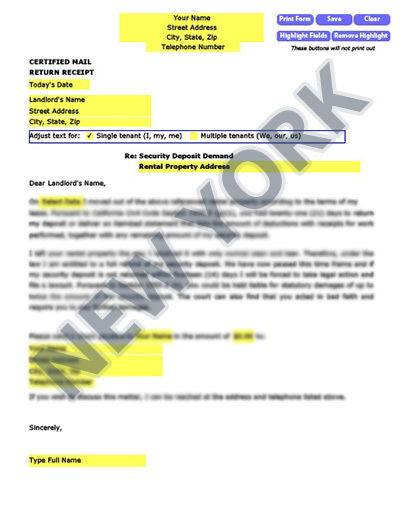 Our letters for New York renters are tailored to your state, with the right laws to get your landlord’s attention. We’ve taken care of the Security Demand details so there’s no hassle on your part to find the right law and craft an approrpriate letter. Our letters have been used in New York and all over America with great success.